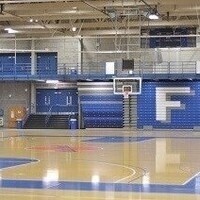 The Steele Hall Fieldhouse is home to the Fredonia State men's and women's basketball teams, and features an indoor track. In the summer of 2013, the Fieldhouse was renovated with brand new bleachers. The Blue Devil women's and men's basketball teams play their home contests in Steele Hall. The Fieldhouse is also home to most varsity teams' practices, Section VI High School track meets and a variety of intramural activites. Steele Hall also houses in indoor batting cage utilized by the Blue Devil softball and baseball teams. It is also the site of graduation each May and holds numerous other activities, including Open House receptions and Activities Night. This was the first time that I attended this event. It was worth the early morning drive. Marletta's Commencement Address was spot on! I'm hoping the graduates took to heart and will follow up on his charge.